For many Americans, the late Jesse Helms is what they think of when they think of North Carolina. And for progressive North Carolinians, there are many, many good reasons to find an association with the utterly intolerant GOP figure objectionable. That may be one reason you’re not likely to hear many kind words about the late senator on these pages, but Capitol Broadcasting Company has published an editorial this morning that asks: What would Helms, a staunch anti-communist, think of President Donald Trump’s gushing embrace of Russian President Vladimir Putin this week? Based on Helms’ comments in 2001, the longtime North Carolina Republican likely wouldn’t have had much nice to say about Trump, even as members of the national GOP today grapple with how to respond to the president’s disastrous trip to Helsinki this week. 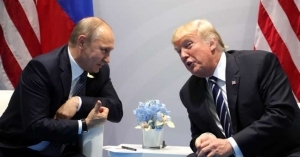 There has been much hand-wringing among conservatives on just how to respond to President Donald Trump’s embrace of Russia’s Vladimir Putin even as he distanced himself from his own government’s fundamental institutions. To those who might be looking for guidance on how to react, they need not look any further than Jesse Helms, the godfather of the nation’s modern conservative political movement. Much has changed since that pre-9-11 time. Most folks (except for our president) are 18 years to the wiser. They know that Putin’s government ordered and financed the meddling and attempted sabotage of the 2016 elections. All aimed to at least build distrust in our electoral process. In 2001 then-President George W. Bush traveled to Europe for a series of meeting with allies and other international leaders, including Putin. Bush’s embrace of Putin wasn’t quite the gushing idolization that Trump expressed this week. But for the time, it was effusive. Helms, the longtime Republican senator from North Carolina and diehard anti-Communist, was alarmed by Bush’s initial chummy assessment of the Kremlin’s leader who’d been an ex-KGB operative. “He’s an honest, straightforward man who loves his country. He loves his family. We share a lot of values,” Bush said at a June 16, 2001 news conference with Putin. Helms wouldn’t have any of it. Just a few days later, when then Secretary of State Colin Powell appeared before the Senate Foreign Relations Committee, Helms didn’t mince his words of concern and caution. See and hear what Helms said. “I would be misleading you if I did not admit to raising my eyebrows at the assertion that Mr. Putin is ‘trustworthy.’ A ‘remarkable leader,’ he was called. And a man with whom we ‘share common values.’ Now, I criticized officials from the previous administration for using nearly those precise words to describe Mr. Putin. And I was dumbfounded to hear them from mine. “For we must not forget that under Mr. Putin’s leadership the press has once again felt the jackboot of repression. Arms control treaties obligations remain unfilled and violated. Dangerous weapons technologies have been transferred to rogue states and Georgia’s and Ukraine’s security has been threatened in brutal, indiscriminate military trampling in Chechnya remains unabated. Helms’ stern warning about Putin proved right. Apparently those who seek to portray themselves as inheritors of his political legacy, like Trump, want more to benefit from Helms image than heed his warnings. Jesse Helm’s prescient words 18 years ago may still echo in the Capitol. On this, at least, his would-be heirs in Congress should perk up their ears. Unhappy to see NCPW spend its editorial space boosting the mainstream media’s obsession with Trump and Russia, and furthermore pondering on what Jesse Helms would think of it all. Helms is easily one of North Carolina’s most embarrassing and despicable public figures of the modern era – a staunch racist who called the Civil Rights Act “the single most dangerous piece of legislation ever introduced in the Congress”, opposed extending the Voting Rights Act, and filibustered for 16 days in opposition to the recognition of MLK day as a federal holiday. Helms remained throughout his entire life until his death in 2008 an outspoken homophobe and crusader against rights for LGBT people. He referred to homosexuals as “weak, morally sick wretches,” campaigned against federal financing for HIV/AIDS research, and voted against Ruth Bader Ginsburg’s confirmation, citing her support for the “homosexual agenda.” When president Clinton urged for gays to be able to serve openly, he commented “When the president visits North Carolina, he better have a bodyguard.” His opinions on every matter, including the Soviet Union/Russia, should be seen for what they were – strictly ideologically-driven and not based in any center of reality. His legacy should not be whitewashed, nor should his thoughts be revisited, especially on the pages of independent, progressive media. I would rather see NCPW’s exceptional reporting spent on investigating what the importance of the ‘Russiagate’ for everyday North Carolinians, and perhaps actually inspect the record, or offer real, substantive comparisons. My view is that this entire russiamania currently infecting the mainstream is a large, distraction. The facts do not in any way bear up to the hype. Did the Russians try meddle in our election? Of course. But the narrative suggestion that this has been some elaborate, sophisticated, beyond-the-pale assault on democracy holds up to no reality. The latest indictment from Mueller, with all of its airport thriller language, boils down to spear-phishing, email hacking, and fake identities, utterly commonplace activities in any espionage apparatus, including our own. The idea that any of this is some existential threat to our institutions is dubious at best, and the rest of the world silently chuckles as we even attempt to suggest it. There is hardly an area of the world we have meddled in our outright overthrown popularly-elected governments. Putin’s mentor, Boris Yeltsin could not have won his ’96 election without the direct assistance of American advisors, and was famously featured on TIME magazine under the headline ‘YANKS TO THE RESCUE: The Secret Story of How American Advisors Helped Yeltsin Win’ http://content.time.com/time/covers/0,16641,19960715,00.html. There are countless other examples it seems pointless to rehash them, but they are well documented and available to anyone. Further, the idea that Trump is ‘soft’ on Russia does hold up to the evidence. He has in fact been much more aggressive than Obama, acting against Putin’s interests: He has sent arms to Ukraine to fight Russian mercenies, which Obama refused to do; he has bombed Syria, actually killing a Russian in the process, which Obama worried would stoke tensions with Russian; and he has trash talked the Iran deal, against Russian interests – Putin actually commented on and criticized this in yesterday’s press conference. Despite the mainstream’s hooting and hollering, the record does not show a russian coup in the executive. The record does however show Trump’s general embrace of strongmen – from Kim Jong-Un, to MBS of Saudi Arabia, to Duterte in the Philipinnes – there does not seem to be any authoritarian he does not fancy. The evidence shows a short-minded, weak, buffoon who simply repeats whatever the last person told him, and not much more. This should not shock anyone, much less the media establishment that has been covering this trainwreck of a human for years now. This is a long post and I apologize, but I will offer something: Instead of dedicating editorial space to well-covered and established mainstream thought that any North Carolinian could see by switching on MSNBC, perhaps the space should be dedicated to wondering what real progressives would have thought about a summit between the world’s two largest nuclear powers, during the current period in which the Bulletin of Atomic Scientists doomsday clock is at 2 minutes to midnight for the first time since the 50’s? Or at the very least, hammer in the point that Trump’s rantings are the distraction, to not be fooled by the sideshow, and the real story is all of the important things that NCPW already covers, the cuts to public services, the effects of tariffs on NC’s farmers, and the deregulation machine that rolling back our environment’s remaining protections.